Cisdem Document Reader for mac let you easily read, print and save WPD, WPS, XPS, OXPS, VISIO, DjVu, PDF, Winmail.dat files on Mac. Using different viewing styles with toolbar consisting view mode, searching pane, page navigation, zoom, rotate, save, copy will give you a great reading experience. 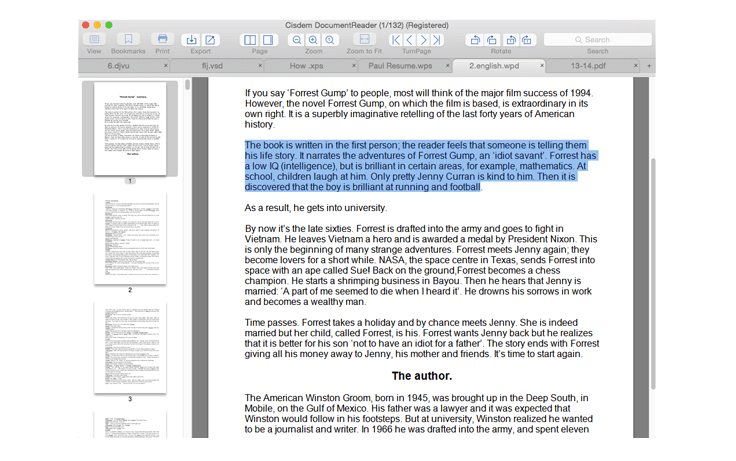 what is more, you can even personalize the toolbar according to your mind.New in version 3.1.0:1.Free to download and get the Document Reader.2.Totally free to open and read any pdf files.3.Fully compatible with macOS 10.13 (macOS High Sierra).4.Some minor bugs fixed and optimization.